Natalia Oreiro, la artista uruguaya, puso sus manos a la obra y con una pala y un poco de tierra dejó su huella en el hotel Sheraton. 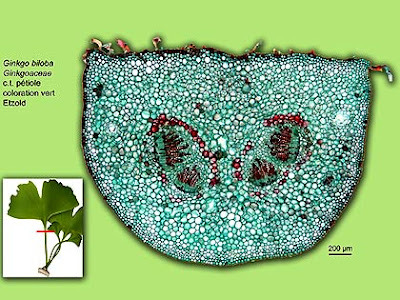 Allí plantó un Ginkgo Biloba, un tipo de árbol que para ella representa la vida. "Elegí este árbol porque para mí representa la vida. Es el árbol que resistió a todas las bombas nucleares y representa la vida en el planeta". Natalia Oreiro fue invitada por el Sheraton para formar parte de La Hora del Planeta, una campaña mundial de concientización sobre el problema climático, por considerarla, más allá de ser una cara conocida, una persona comprometida con el medioambiente. 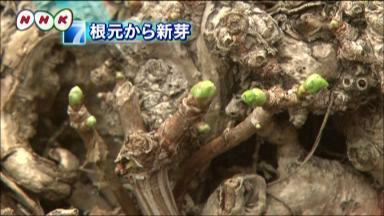 * New topic: Hachiman Ginkgo broke after 1000 years. 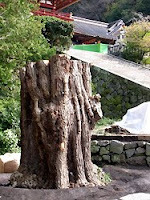 the famous Hachiman Ginkgo tree (1,000 years old, 35 m, girth 6 m) broke probably due to bad weather, more research is needed. 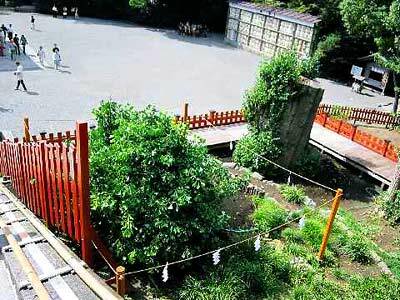 It is a great loss for Kamakura and Japan. 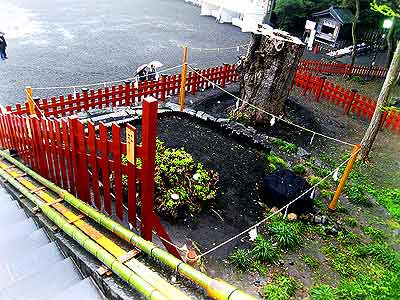 Shigeho Yoshida, the chief priest of Tsurugaoka Hachimangu, is too shocked to comment on the matter, a shrine official said. 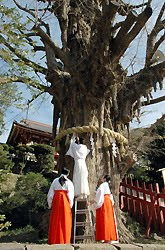 Other priests, who are also in shock, made spiritual gestures by offering rice and sake to the collapsed tree. The giant Ginkgo tree, well known as a symbol of the shrine, was dubbed "Kakure Icho" (hidden ginkgo) since monk Kugyo hid behind the tree when he assassinated Minamoto no Sanetomo, the third shogun of the Kamakura Shogunate, in January 1219. 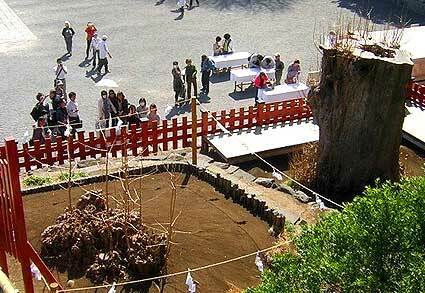 The giant Ginkgo in 2004. More info about this tree on my website. More related videos can be found on YouTube. Update March 13, 2010: There are plans to restore this tree. 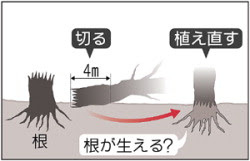 Tokyo University of Agriculture professor Chikayasu Hamano said: " "Although it's not for certain, new roots may grow from the trunk if we plant it again." 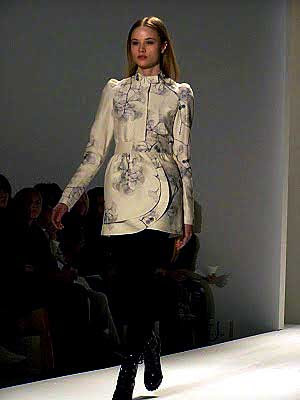 It is also hoped that young trees may grow from the roots still remaining in the ground. 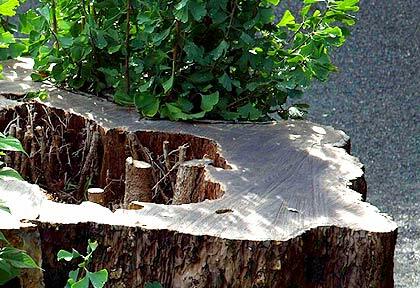 The trunk will be cut off about four meters above the fracture and planted near the root remaining in the ground after removing extra branches. The shrine has already started preparing for the project. Read more here. 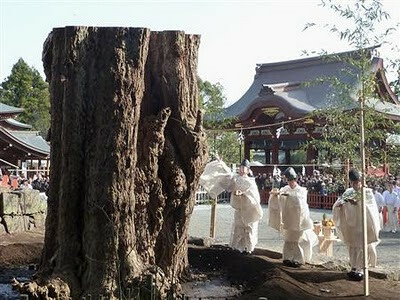 The trunk was cut off about 3.6 meters above the fracture and planted by the stone steps leading to the shrine's main hall, about 7 meters west of the roots remaining in the ground. 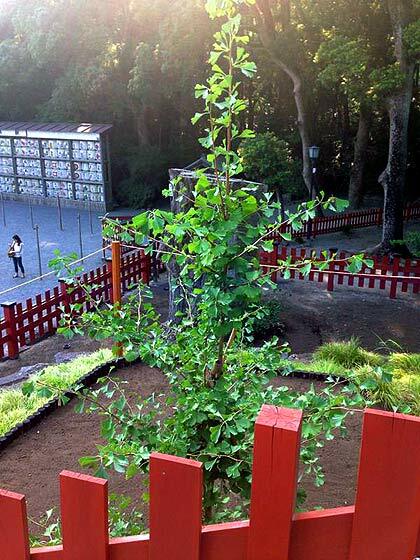 The stone steps are temporarily not available for use, but the replanted ginkgo tree will be unveiled to the public in the near future. Read more here. New shoot with leaves from the original roots! New shoot as it is now! Wow, great tree, a survivor! 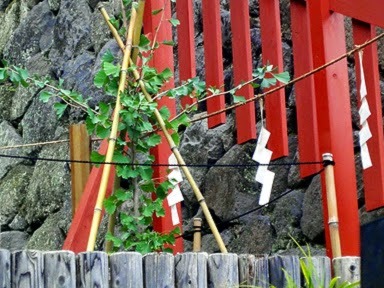 Composition in memory of the giant Hachiman Ginkgo tree in Kamakura, Japan. Premiere of "Behind that Ginkgo tree" for tuba and piano. May 27, 2010, Tucson, Arizona at International Tuba Euphonium Conference 2010. 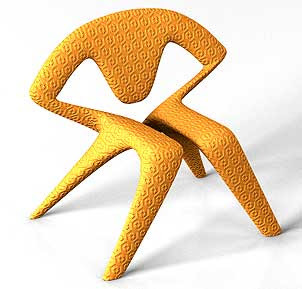 Tokyo Ginko Chair Design by Onur Müştak Çobanlı - OMC Design Studios. The shape comes from the Tokyo city logo (Ginkgo) and it was elegantly modified into this industrially produceable molded plastic ginko chair. * Update picture gallery Fossils-page: Ginkgo hallei. * New photo photospecial page: Ginkgo penjing (bonsai), Xian, China. "The first time I sautéed ginkgos, they were a revelation — deep and nutty-tasting, and the consistency of roasted garlic, the soft kernels transformed from yellow to the color of shiny jade. Except for a slightly bitter aftertaste which can be hidden when added to other foods, I loved them." 1. Crack open ginkgos with a nutcracker. Kernels should be pale yellowish and partly covered in a papery-thin brownish membrane — to be discarded in the cooking process. 2. Toss in a bowl with first half teaspoon of oil, plus, salt and pepper. 3. Heat up remaining oil in pan on medium-low flame. 4. Add ginkgos and cover with a splatter screen for protection from sizzling oil. 5. 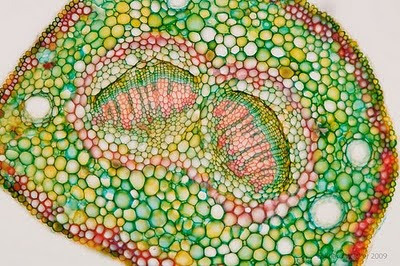 Shake often, until kernels turn a shiny, verdant green. 6. Transfer to a platter with paper towels. Wrap sautéed ginkgos in towels, making sure to hold them carefully in an envelope-type-fashion so that none escape to burn tender fingers. Roll the entire bunch gently, so that the thin outer membrane separates from the green kernels. 7. Serve warmed ginkgos in a bowl or on a skewer, Japanese-style, picking out any remaining outer layers. Read more: "The Local Blog", by students and faculty of the CUNY Graduate School of Journalism, in collaboration with The New York Times.